Welcome to Boston Mamas Rock! – where we’re giving a voice to fabulous local mamas from all walks of life. Read on for today’s interview with Melissa Roiter, mother of triplets and owner of Yummy Mummy Brownies, a locally based but nationally serving brownie and apparel business. Then nominate yourself or a friend! Christine: Welcome, Melissa! You own Yummy Mummy Brownies, and have maternal roots steeped in baking. Do you, or your similarly passionate baking mother, aunt, or grandmother have formal baking training or has all of your knowledge been cultivated at home? Christine: Tell us about the moment when your grandmother shared her famous brownie recipe. Did you feel a spark of business inspiration at that time? What inspired you to make the leap to running an online business? 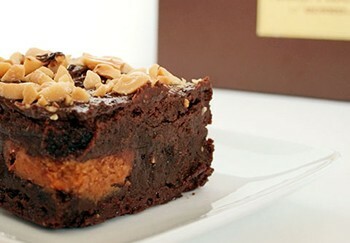 What were you doing prior to the launch of Yummy Mummy Brownies? Melissa: My grandmother has baked her brownies my whole life. I don't remember an actual day that she shared her recipe with me but I know it was early on, as I baked them all through high school and college. It wasn't until almost three years ago that I started making them for the purpose of selling them. I just baked them to eat myself or to give as gifts! Once I set up my business, I realized that as a mom of young kids, I did not have the time to produce and sell the brownies on a large scale. I decided to sell them at show/events, as favors and online, as this allowed me to manage my time a bit better and spend more time with my family. 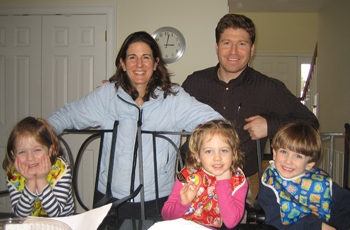 Before I started Yummy Mummy Brownies, I was a stay-at-home mom (my kids were two when I started). Before kids, I worked in admissions at a small local college. Christine: You're a mom of 4-year-old triplets. Tell us where you were with the development of Yummy Mummy Brownies in relation to your kids. 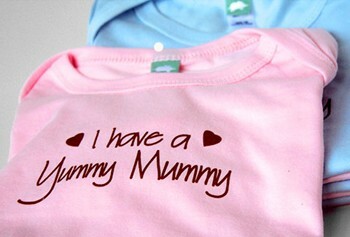 How have you managed to juggle being a mamapreneur of triplets? Melissa: Having three young kids at home, I made an executive decision to keep Yummy Mummy Brownies small. It has been the most important and best decision so far. For the first two years, I did not advertise, and I continue to only book events when I know that I have plenty of help at home. This coming fall, when my kids are in kindergarten, I plan on expanding Yummy Mummy Brownies. Christine: Do you have a team, or is it just you behind Yummy Mummy Brownies? How do you handle the unpredictability of a business where you bake to order? Melissa: Right now, I am the only one working for Yummy Mummy Brownies. When things have gotten busy, my husband, friends, mom, and extended family have helped me tremendously with their time and advice. However, I am not sure how much longer I can count on the free help! Baking to order is great because I know what I need to make and go ahead and do it! When I have my fairs, I bake and bake but am not sure if I am going to sell everything. When I bake to order, I know what I am going to bake will be sold. It is more efficient. Christine: What has been the most challenging thing about being an independent mamapreneur, juggling the high demands of a new business with family life? Do you have any nuggets of wisdom for aspiring mamapreneurs? Melissa: I am lucky because most of my work with Yummy Mummy Brownies is out of my home. I bake there and do all administrative work from my kitchen-based laptop! My kids play while I work. Because they are the same age, they enjoy playing a lot of the same games and generally get along well with each other. My priority has definitely been my kids, especially since they are home every day at noon! I tend to work a lot either at night or very early in the morning. However, I believe in my business and know it can be successful. I am purposely keeping it small for now but have ideas to grow it soon. That might mean hiring people to help with the workload. My advice to others is to follow your passion - it will feel less like work and more like play! Moms should also look at the big picture - family, economy, stressors, etc. - and realize when the time is right to start a company. It might be when one's kids are in grade school or in college. It is a personal decision. Christine: You showcase your goodies at events. What types of events? Have you found it to be an effective way to build your client base? What other forms of marketing have worked well for you? Melissa: I have attended the South End Open Market for two summers. It runs Sundays, May-October and gets great foot traffic. I set up my tent about 6 times each season. It has been the best way to test market my brand and brownie varieties and a great way to meet people face to face. I also attend several holiday markets throughout Boston and Metro West, outdoor seasonal fairs, and large shopping events like Stylefixx. Making donations has also been important. I am supporting important causes as well as sharing my brownies with potential customers. I plan on getting into the wedding industry by attending upcoming wedding expos. Brownies make great favors, room gifts, and offer a change from traditional wedding cakes. Christine: To backtrack a little and slightly off topic, my understanding is that the spark for your business name followed a mommy makeover in The Boston Globe. How did you get hooked up with the makeover? And have you been able to maintain any of that transformation? I always wonder about the maintenance factor when I see makeover shows! Melissa: I received the amazing makeover as a mom of young children. The style writer for the Globe contacted my triplet organization, Triplets, Moms, and More. I was lucky enough to see the online post and replied immediately. I went "shopping" at Saks and tried on many outfits. However, I didn't get to keep anything... it was just for the photo shoot! I think the whole outfit cost over $2,000! I also got to go to Mario Russo's salon and have my haircut and colored (by him!). In terms of upkeep, I had them highlight my hair gently. I am not one to keep up on things like that. I actually let it grow out and have not had it done again. The cut was great and I have kept a similar style ever since. As for the makeup, well let's say it was put on for the photo shoot...heavy! Christine: I’m known as a blogger committed to green issues so I must ask: do you have a current or impending commitment to using organic ingredients for your brownies, or for your apparel collection? Melissa: I have actually given a lot of thought to offering organic brownies and organic clothing as well as brownies that are gluten free, nut free, and/or kosher. As I expand my business and clientele, it is something that I will spend time to research and execute. If you know of any affordable organic clothes providers, I would be happy to contact them for samples! Christine: We’ve talked all business up to now. Tell us about the favorite things you do to unwind or any hidden/unusual talents you may have. Melissa: I run to unwind. It is something I do nearly every morning, rain or shine. It is quiet time to myself... time to breathe and enjoy the outdoors. I also enjoy spending quality time with my kids. Recently, we’ve been going out for hot chocolate. I pack coloring books and we sit for an hour or so, just coloring, talking and relaxing. Christine: And finally, what’s your favorite thing about being a Boston mama? Melissa: I think Boston is the best city! It has several unique areas - from the North End to Chinatown to the South End. Each place offers a different feel and experience yet they are only streets away from each other. Taking the kids to the various restaurants and stores is a bit of a history/geography lesson. I also love that there are so many accessible activities for families - the duck pond, the waterfront, the fabulous Children's Museum, playgrounds, farmer's markets. Lastly, the BEST thing about being a Boston mama is taking my kids, one at a time, to see a Red Sox game. Sharing my love of baseball with them, one on one, and watching them take in all of the sights and sounds is something that I look forward every year. Know a fabulous local mama? Nominate yourself or someone else to be featured!